Herwiss Lighted Makeup Mirror, Portable Bathroom Vanity Mirror with 10x Magnifying for Beauty Cosmetic Shaving, Dual Power Supply 180 Degree Rotation Trifold Makeup Mirror by Herwiss at Baharta. MPN: 600HP340000000WISS. Hurry! Limited time offer. Offer valid only while supplies last. 6 Reasons Why This Illuminated Travel Mirror Is A Must Keeper: Soft LED lighted makeup mirror with sturdy base! For unparalleled brightness. Soft LED lighted makeup mirror with sturdy base! For unparalleled brightness. Trifold HD mirror & removable round mirror (10x magnifying). Wide (8.8x 6.8''), yet compact! Smooth touch sensors for adjustable brightness. 180¡ã free rotation for optimal use! Crystal clear HD view field (8 layers of electroplating). Works on batteries or via its USB. It's all up to you! HASSLE FREE MAKEUP APPLICATION: The tri-fold makeup mirror with lights and 10x magnification is a must have for applying makeup, eyeshadow, eyebrows, contouring, shaving, beauty masks, moisturizers, and other facial treatments. ENJOY SOFT NATURAL LIGHT: Equipped with 16pcs LED, the light up vanity mirror provide you crystal clear view and brilliant makeup environment. Enjoy a flawless and accurate makeup every time. CONFORMS TO YOUR NEEDS: This trifold vanity mirror is auto shut off, touch sensor and 180 degree free rotation. Plus its 10x magnifying round mirror is removable, fix it to any position to achieve the desired results. 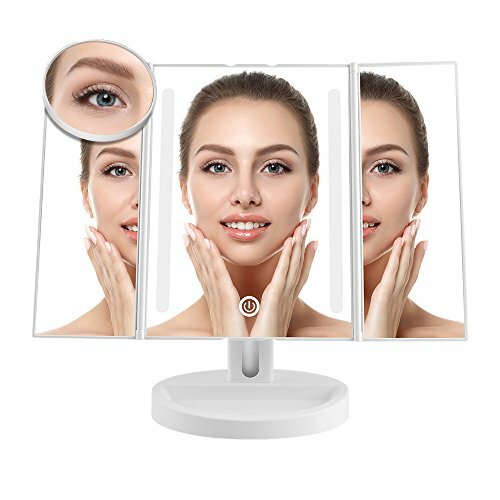 RISK FREE COSMETIC MIRROR: Herwiss lighted vanity makeup mirror is backed by our unconditional 30-day money back guarantee, 100% Satisfaction Guarantee for your purchase. If you have any questions about this product by Herwiss, contact us by completing and submitting the form below. If you are looking for a specif part number, please include it with your message.